Last summer Sharon attended the Great Northern Arts Festival, a 10-day Artist-In-Residence Project in Inuvik, NWT. She exhibited her paintings, ran workshops, facilitated community murals and shared the everyday culture of the people. And she became excited about the landscape of the north. 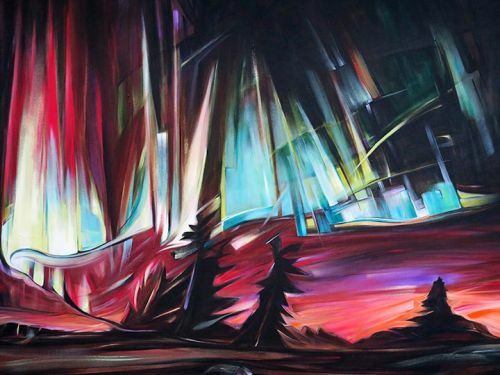 Paint the night sky with Sharon Quirke, (or use your own reference). She will show you her favourite techniques in acrylic paint: transparency, rainbow layering and luminosity. Experiment with abstracting through a focus on movement and light. 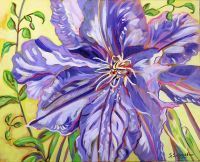 Sharon Quirke is a professional artist living in West Vancouver. Her style is bold and dramatic; her works moves with the fluidity of light. Sharon's work is represented across the continent, and is found in numerous corporate, commercial and residential collections. Sharon will be teaching with acrylics, but she welcomes oil painters as welll.